Yesterday, Parade magazine offered a regular feature: “What People Earn: Our Annual Report.” Out on the cover and inside the magazine, Parade let us see how much people earn in all the various occupations. Well — in all the various occupations but one. By our count, Parade offered head shots, with annual earnings, for 71 different people. There was a teacher, a pilot, a CEO and a realtor — two singers, a rapper and a big famous film star. But one occupation was oddly missing. No journalist could be found in the mix! How much are major journalists paid? Major journalists rarely discuss that. ….Next year, could this feature include the earnings of some big major journalists? 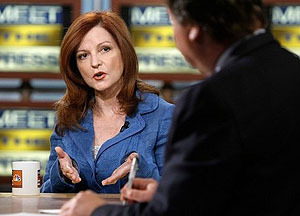 How much is Maureen Dowd paid, for example? Why can’t she and Rich grace Parade’s famous cover? We have literally never seen an estimate of Dowd’s yearly swag. We’re also curious how much she paid for JFK’s pad — how she managed to land such a pad even before she became a big columnist. Big journalists ask questions like that about everyone — except about other big journalists. Well, maybe there were no big journalists, but in the online version they did include sports blogger Josh Bacott, who makes $10,700. And TV news reporter John Dougherty, who makes $25,500. So they’re trying! But sadly, no Dowd. Maybe next year.